Superbly equipped modern detached villa set in large level grounds with private solar heated swimming pool & wifi. Flexible arrival and departure days. You can be met locally on arrival & shown how everything works; your pre ordered shopping in the fridge. Ideal for families wanting a quiet relaxing sun filled holiday but with easy access to local towns, beaches, shops and restaurants. The modern villa is cooled in summer by air conditioning in each room, fans & shutters in the bedrooms. TV gets german, french and english channels by satellite. High level of repeat bookings; 75% of 2018 bookings were from returning families. 2018 has seen the following villa improvements; new air con throughout (1 in each of the 3 bedrooms and 1 in the lounge), new dishwasher, washing machine, oven, new double doors with electric shutters from rear bedrooms to terrace and both bathrooms renewed. All appliances were chosen for energy efficiency and quality german brands; Miele and Siemens. German and french tv by satellite so a strong signal. Denia attractions: Denia is the nearest main town & has the greatest choice of shops, restaurants, cafes & beaches. The town is very easy to walk around & parking is free. The shops are mainly boutique style & well priced. Twice weekly outdoor markets, indoor fruit & veg market every day & in summer an outdoor hippy market is on every night, fish market every evening where you can watch the fish being unloaded from the boats straight onto the stalls. Restaurants are numerous so quality & pricing good. Most have outdoor terraces where you can eat, people watch & enjoy a coffee or beer in your own time. Some have nearby children's play areas so you can eat & keep an eye on the little ones. Maps of the local towns are kept in the villa which you are welcome to borrow to help you get your bearings. All activities listed above are written up in the villa guide with clear directions of how to get there, what it costs & whether it is worth going. All villa rental costs must be paid in full and cleared before the holiday begins. The ensuite bathroom off the main bedroom has a full sized bath & wc. The other bathroom has a shower & toilet. There is another shower outside on the terrace. Beautiful location and Villa well equipped. We have just had a relaxing holiday in this perfect villa. The villa was well equipped with toys for the kids in the pool and inside the villa. The location was amazing being in a nice quiet area and just 10minutes to the most beautiful quiet beaches. The villa was clean and had everything we needed. Thank you Neil for making our holiday so nice and we are looking forward to coming again in the future. We (2 adults and 2 small kids) had a fabulous week here in March/April, although you can't expect much from the weather at that time of year, it was in the 20's on most days, and the heated pool perfect to come home to after a long walk or run. The villa itself is one of the best equipped we have been to in Spain, with everything we could think of needing on a holiday (when oranges were 0.5 euro/kg the citrus juicer was especially welcome). Prompt and rapid communication from Neil made made everything as simple as possible. Internet was ok, and actually if you are on roaming on Moviestar the speeds were pretty similar. Although the Monte Pego region was new to us we can't wait to return. Hi Euan, thanks for the 5 star review and i am glad you enjoyed your stay. I have actually just replaced the juicer and blender as they have been well used over the years due to the abundance of oranges, lemons and grapefruits. The blender makes nice smoothies from the citrus juice base. 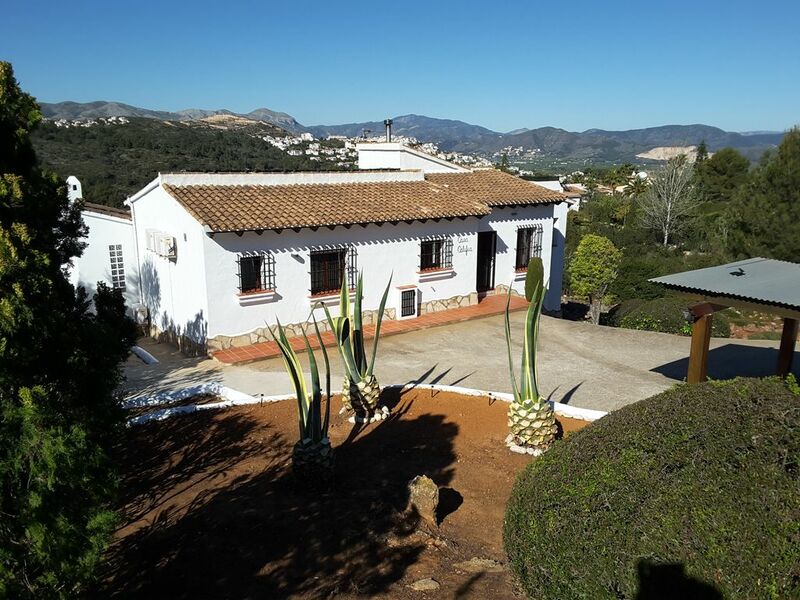 Recently returned from 10 days at Casa Califia – an excellent villa for a family holiday, high on the Monte Pego hillside with great views over the valley. The villa is just a short drive from several local towns and villages, supermarkets and lots of beautiful, sandy beaches. It’s also within striking distance of Alicante and Valencia, both of which are well worth a visit. We’ve stayed in several Spanish villas and this was certainly the best, with creature comforts and good equipment that made it feel more like a home-from-home than a holiday let. The villa was clean on arrival, with supplies ready in the fridge, some of which Neil (the owner) had arranged for us in advance. The pool is excellent: big enough to have a proper swim, well-maintained and there are lots of pool toys for the kids. Although it was hot in July, there was effective air conditioning in all the bedrooms and the lounge, with a covered terrace outside that caught the breeze and was very pleasant to sit in. The kitchen is small, but well-equipped with decent cooking facilities, a large fridge-freezer and a dishwasher. The barbecue area is well set up with an outside fridge, a large worktop and a sink. Our experience of Wi-Fi Internet in rural Spain has never been great and, whilst not ultra-fast by UK urban standards, this was by far the best we’ve had, which kept our teenagers happy. The TV setup was also good, with HD satellite and UK channels, as well as a Netflix app all integrated with an external sound base. Neil also has a portable Bluetooth speaker to connect to your phone if you want music elsewhere. A late flight into Alicante meant that we arrived in the wee small hours. The villa itself is set back a little bit from the road, making the name sign quite hard to make out in the dark, so familiarise yourself with its location on Google Street View first to avoid any hassle finding it (Neil will provide directions before you leave). The entrance to Monte Pego also has an odd road layout, so don’t be put off when you’re forced along a very narrow side road with a coned-off cycle lane, rather than driving straight in from the main road. Neil was very helpful and responded promptly to our emails. If we were to have another family holiday in this part of Spain, we’d certainly book Casa Califia if it’s available. All-in-all, it's good value for what you get and we couldn't recommend it more highly. This villa has everything you could possibly need for a relaxing stay in sunny Spain. The villa itself is very nice inside, very clean with lovely newly modernised bathroom and shower rooms. Neil has thought of everything with regards to the equipment at the villa - it really is like a home from home. The pool is perfect and has beautiful views. The selection of pool toys, outdoor play house and kitchen and the table tennis and football tables made the stay even more enjoyable for our 4 year old. Neil was on hand for any advice and help we needed. Highly recommend and would love to return. Hi Samantha, thanks for taking the time to post a 5 star review and I am glad you all had a lovely stay. I hope to see you all again soon. Lovely villa, great location, highly recommended! Just returned from a Easter break at Casa Califia with 2 teenagers and 2 adults. The villa is lovely, very clean and has everything you need for a very comfortable stay. The views over the mountains are wonderful and we enjoyed some stunning sunsets from the terrace. Everyone enjoyed the pool, and with the heating on it was great even in the mornings when the weather was a little cooler. Neil made us very welcome, was very prompt with emailing arrangements and was very helpful with tips and recommendations. And being able to order some food in for when we arrived was fantastic (we arrived late on Saturday and the supermarkets are closed on Sundays). Monte Pego was very nice and quiet, which suited us fine, and the drive to the supermarket or beach wasn't far (and we walked to the Swiss restaurant one evening - recommended). Further afield there is lots to discover (lots of useful information in the villa too), so we were never stuck for ideas. The villa is in a great location for exploring the area. Overall we had a fantastic stay and would highly recommend Casa Califia! Thanks Neil and family, i am so glad you had a fabulous holiday and posted a 5 star review. The sunsets are currently stunning. Shopping for late/sunday arrivals no problem at all. Located close to the Spanish towns of Denia, Javea, Oliva and Pego in the northern Costa Blanca. Valencia city is easily accessible by car or train for a day out shopping & sightseeing. Superb indoor shopping centre 10 minutes drive. Beaches 10 minutes & Benidorm theme parks 35min. A good base for mountain walking & road cycling, in fact, over the years many guests coming in the cooler months have enjoyed this. Maps & tips of where to go & what to do are available & you can always ask the owner for advice before arrival. Utility allowance of 200 kws per week electric and 7m3 water is included in the above rental rates. Any usage above this allowance will be deducted from the damage deposit. Any firewood used and not replaced will be charged. Please call the owner directly on 0034 670 778408 to discuss the suitability of the villa.